Construction on Lake City Way at 125th St.
Traffic advisory: SDOT is going to be nearly doubling the length of the southbound bus stop on Lake City Way, just south of NE 125th St. Currently, the zone is 65-feet long and can only serve one bus at a time. When there are two coaches that approach the zone, one bus must wait on the north side of the intersection, delaying bus patrons, while also causing traffic backups on both southbound Lake City Way and eastbound NE 125th St.
To address the problem, a contractor will lengthen the zone from 65 feet to 125 feet. They will bulb out the sidewalk/curb this additional length, which will permit the two coaches to load and unload passengers without having to pull out of traffic to do so. 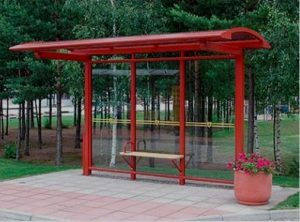 The project will also mean the addition of a second bus shelter, a lit cantilever shelter. The existing “box” style shelter will also be replaced with a cantilever. This style of shelter is designed to be more open, making the internal area of the shelter more visible and less prone to loitering. Construction is likely to last three to four weeks. Most of the construction will occur on weekdays, with traffic reduced to a single southbound lane at this location on weekdays from 9 AM until 4 PM during construction. During the AM and PM traffic peaks, the contractor will be required to keep both southbound lanes open to traffic. A big impact will occur the first weekend in May when the contractor will be replacing damaged road panels adjacent to the stop. This will require a full closure of the southbound lanes of Lake City Way at this location, from Friday, May 4 at 7 PM until Monday, May 7 at 6 AM. Traffic will be detoured eastbound on NE 125th St, and then again southbound onto 30th Ave NE, back onto Lake City Way NE. Contact Christa Dumphys with any concerns or questions, at (206)386-5458. SDOT realizes the loss of any on-street parking spaces in a commercial corridor is not popular with adjacent businesses. Fortunately, it is only three spots, and it hope the businesses understand why they are moving ahead with this project. 1 comment to Construction on Lake City Way at 125th St. Thanks, I wondered what was happening there when I drove by last night!